At St. Jean Vianney a philosophy of simplicity in forms and materials exalts the integrity of this sacred space, designed in response to Vatican II doctrine. Devoid of excess ornamentation, the sanctuary’s central focus is the gathering experience. Honest expression of the materials and structure further emphasizes the spiritual nature of the space. Light and nature actually function as design elements engaging the senses within the space. Natural light activates the worship space and encourages the communal relationship. Walls of windows actively invite nature into the sanctuary and afford an awareness of the sun, moon, rain, seasons and time. The materials used are authentic and pure, without embellishment or distraction. Concrete, glass, wood and steel—carefully detailed and combined—create a canvas that acts as a background for the celebration of the liturgy. Natural light, playing on these materials, acts as an architectural element and makes the spiritual experience of the building even more profound. 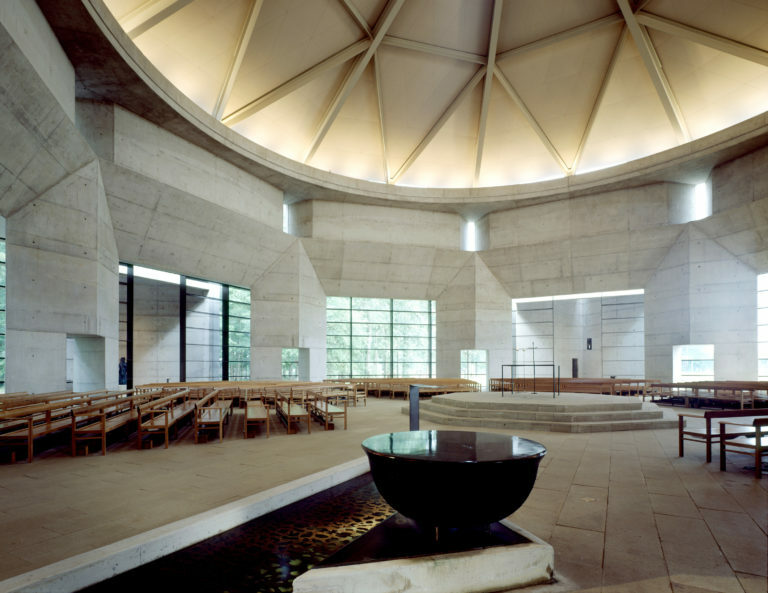 The project’s centralized plan—octagonal in shape—focuses on the raised altar, with all pews facing this focal point. The geometry of the space is conducive to gathering around the altar and recognizes the importance of witnessing the celebration of the sacraments. St. Jean Vianney makes a strong architectural statement from the exterior, and the architect carried the design idea through to the interior in every detail. It is one of the most well-wrought churches, consistent from outside to inside, including issues of form and the use of light and detail. Throughout his career, DeMoss’s work has echoed his early affinity for the Classical aesthetic. Often using the fragmented form, DeMoss’ subject matter ranges from the figure to Biblical allegory, from abstract to narrative. For St. Jean Vianney Church, DeMoss created bronze elements that are highly personal and site specific. The doors that grace the entry way are created from objects parishioners pressed into the form work on site. 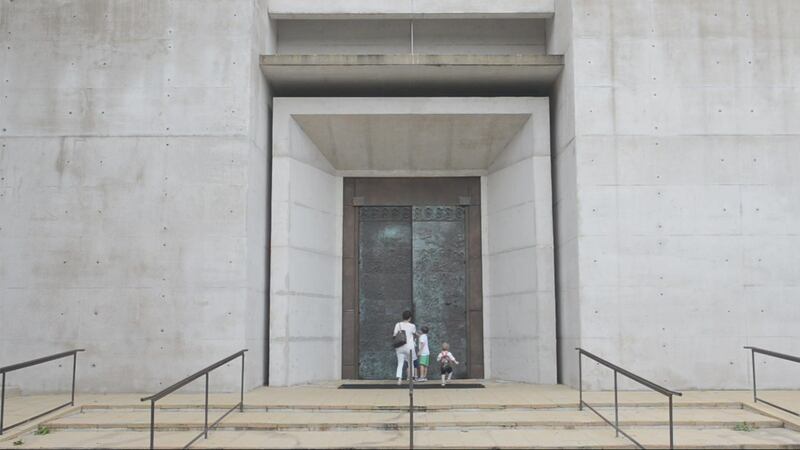 As the doors age they have become a living time capsule marking the spiritual threshold. A domed ceiling with an oculus at its center draws the eyes of the worshipper to the center of the space and up to the skies. This oculus is the culmination of repeated concentric expressions of architectural elements that begin at the entrance to the building.